Type VC 1923. Single valve dual-crystal receiver. A very early, elegant and unusual set. 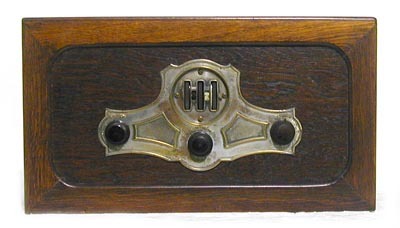 Similar (not identical) panel to the Radiola twin crystal set, but a single valve is housed underneath, accessible via a door in the back. Original 'phones in box. This is a superb example, from an original source, has not been on the market before. No splits in the cabinet, all transfers clean, early top pip valve- a very nice and quite rare set. 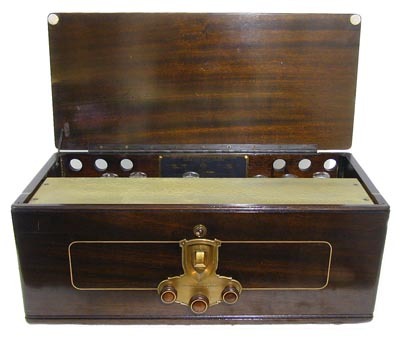 Kolster- Brandes 3 valve battery set, oak cabinet. Very good condition, appears all original and complete. Nickel plated panel around controls. 1925. Very small horn speaker, alloy body. Brown paint cracking but no damage and working. 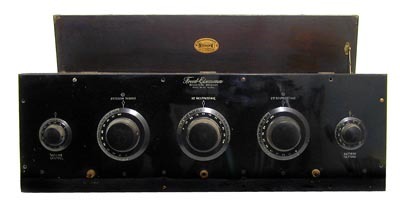 Twin crystal set 1924. First class example, Lovely transfers, no splits or damage, correct BTH 'phones, super clean, original set. 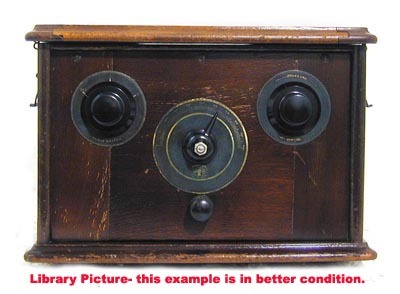 1929 Battery portable, very clean tidy condition, probably restored- cabinet has been refinished well above average. Very good clean example of this classic set from 1926, 2 valve, best one we have seen for a good while. All original. Crystal set 1925. We had one of these a while ago in its original box, which appeared to be unused. This is another one with original box, but has probably been used and the box is not quite as good. However, it has got the separate box for the coil. 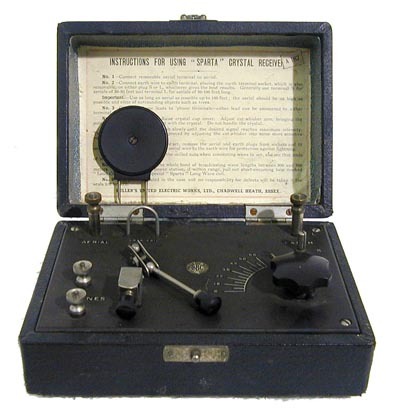 (Marked 'BBC Band' ) and has the Permatector detector as well as the glass enclosed cat's whisker. Rare item, in excellent condition. 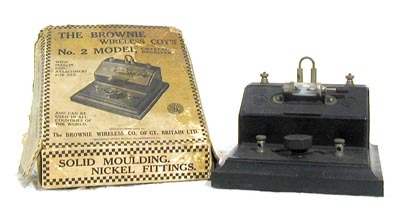 Model NR-20 1924. American made 'Neutrodyne' set, high quality 5 valve (UX201/301), 3 tuned stages. Super original condition, rare in the UK and in genuine original condition. A good example of a high-end American set of the period. All valves present, not tested. A British set of this age and quality would be worth at least double. 4 valve TRF, made by the Daytona Fan and Motor Co. Never heard of them, but this looks a good quality set, solidly made, 3 valves present (USA types of course). Good condition. 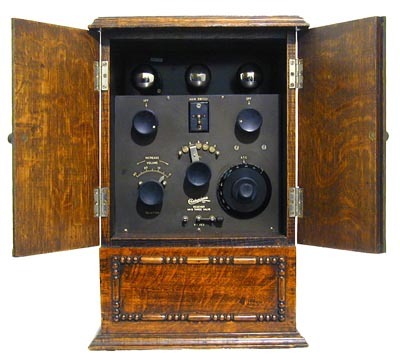 Very impressive 8 valve mains TRF in solid walnut cabinet, with brass details and inlays. Very high quality, heavy set. MW only and 110v of course, has push-pull triode output stage with 4 tuned stages. The chassis is covered by a gold crackle finish cover with the valves protruding through holes, which is almost a pity as the underneath is very impressive and in superb clean condition. It needs an external speaker, not sure of the impedance as I have not had a chance to check it yet but I am assured that the set works very well with high sound quality. c.1929. I don't really have any information on this set, it is a conventional 3 valve TRF battery set similar to many others produced around this time. It is however in outstanding original condition, the dark oak case and grained front panel being virtually unmarked and inside it looks practically as it must have been when new. It has access from a removable back panel, which has printed instructions inside. The components and valves are mounted on an engraved ebonite 'chassis' rather like a Graves. 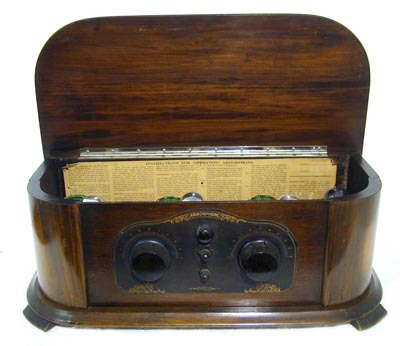 'Super Range Portable 4' 1929. 4 valve screened-grid portable. Leathercloth covered wooden case. Not the same one from last time, this is presumably earlier as it has a wooden speaker fret instead of bakelite. Very good, clean, original. 1924. Pedestal Model De-Luxe. One of the most impressive and rare items we have had for a long time, this is a stunning piece which would be the pride of any collection. One family owned from new, has never been messed with. (The original seals on the panel are intact.) The centre doors open to reveal a fitted horn speaker, grained to match the mahogany cabinet. This was a very expensive set new, the top of the range by this famous Wolverhampton motor cycle manufacturer. 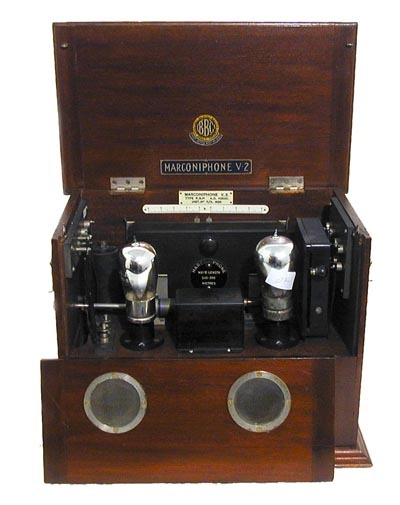 2 original top pip valves, this rare set is in very good totally genuine original condition. We have had a number of these sets over the years in various conditions, but I don't remember ever seeing one as good as this. The cabinet appearance is so good that I suspected at first that it had been repolished, but as all the original transfers are on top of the finish, it must be original. The inside is pristine as well, and it has 2 original nickel base top pip valves, which appear to be good. 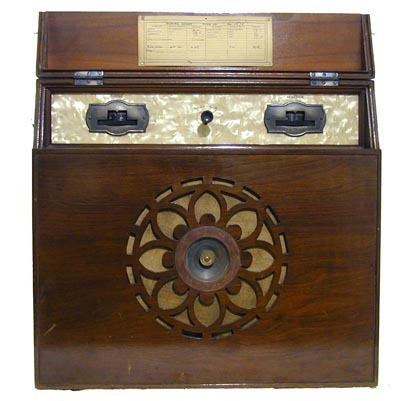 One of the first AC mains receivers, also one of the first to use the new AC screen grid valve - and also one of the first to cover short wave bands. Coverage goes down to 16 metres, very unusual for the time. 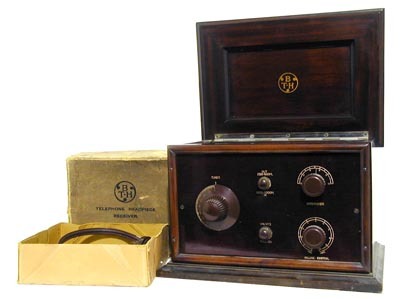 This set is in excellent condition, a very impressive radio (24" wide). It is working, and has a copy of an article (possibly from the BVWS bulletin) referring to Tony Constable describing a restoration which appears to relate to this set. A very impressive and quite rare set which can actually be used. Crystal set c.1924. 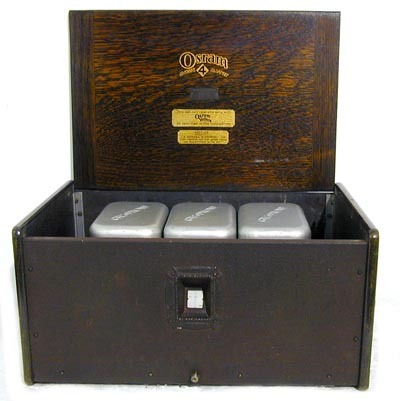 A well known crystal set from Sheffield manufacturer J. G. Graves which was also one of the first mail order hire purchase stores, selling everything from watches to home workshop tools. In a dark oak cabinet, brass fittings, all original in very good condition with BBC transfer on the panel and colour monogram inside the lid. An honest looking genuine original set. c.1925. 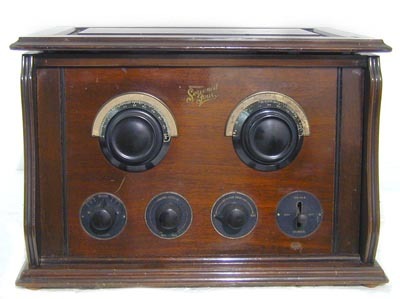 It is hard to do justice to this set- it is not a great looker, rather a conventional 20s lift-up lid 3 valve wireless. 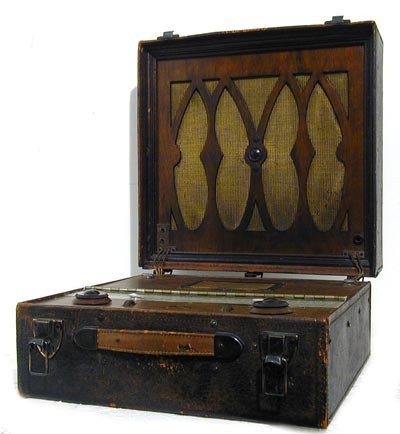 However it is in remarkable original condition, in gleaming mahogany with nickel fittings. The build quality is exceptional, having special moulded ebonite valve bases and beautifully made components, all of in-house manufacture. Complete with BTH headphones in original box. Stunning original piece. A well made unusual set. Has ebonite panel with ebonite part sides, one carrying a swinging coil unit. 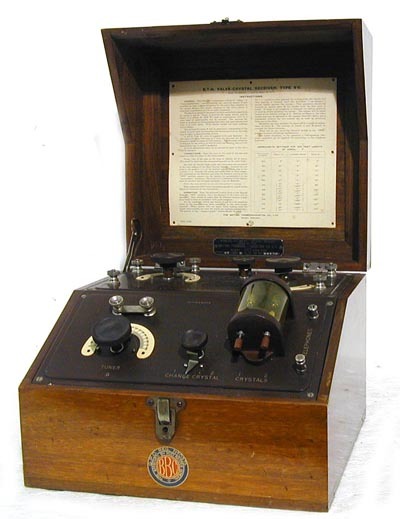 'Burton Micro-Log' vernier tuning scales, one illuminated. In very clean condition, built to a high standard. Presumably unique. 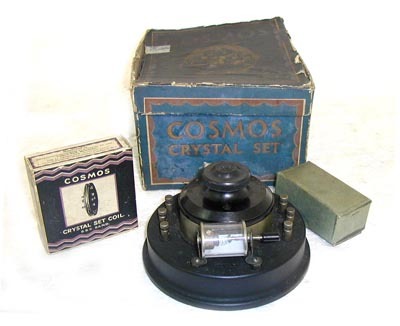 Crystal Set 1923. Popular, compact crystal set in solid walnut cabinet, well made with nickel fittings and moulded ebonite panel. Very good original condition, BTH and BBC transfers, instructions in lid. Has a retailer's plate from 'H.H.B. Sugg, Angel Street, Sheffield'. A large 'portable' set, 5 triodes in a conventional TRF line-up. The controls are mounted on a 'mother of pearl' effect panel covered by a hinged lid with station card. Excellent original condition, really nice clean set that is also quite rare. Believed to be working. Crystal set c.1924. Neat little set (only about 6" wide, 2" deep) in a rexine covered cabinet, very attractive with instructions in the lid and nice nickel plated fittings on ebonite panel. BBC and PMG marked. A feature is that it has the original 5XX loading coil, very rare to find and of unique construction for this model.The set is all in very good to excellent original condition and I think is one we sold around 1998, then again about 5 years ago. 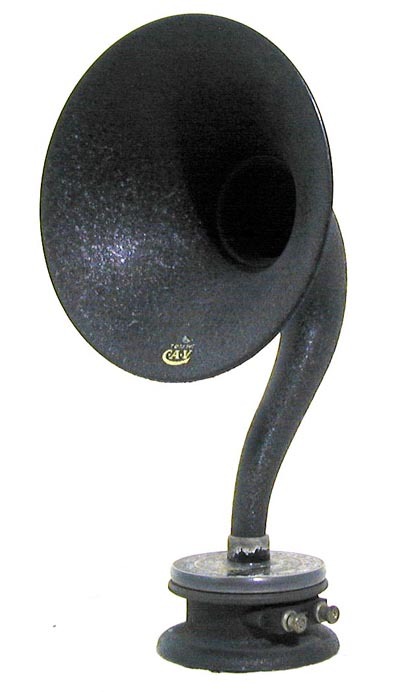 Chakophone model 1B c.1925. A rare and unusual set in the 'Smoker's Cabinet' style. 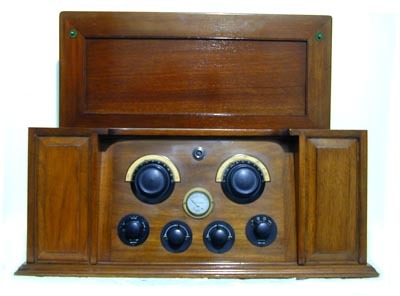 Light oak cabinet, with two doors covering the panel similar to the Gecophone BC2001. (Only a rarer set.) Lovely original condition, 3 valve, originally presumably bright emitters. c.1930. 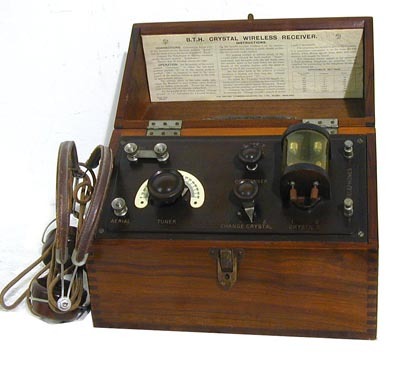 These sets were made by GEC as a kit, sold under the Osram name usually used for the valve division. A very good example, well above average condition, Battery 4 valve set in oak and painted alloy cabinet. c.1923. 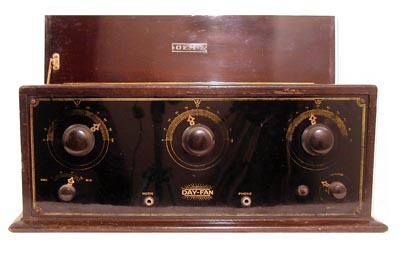 Single valve receiver, quite rare and in exceptional original condition. It is almost as new, quite remarkable for a set of this age. Just a basic single valve circuit, but nicely made as you would expect from this company. 1928. An interesting high quality set in mahogany cabinet, with the early double-ended S625 screened grid valve visible in the top of the cabinet. 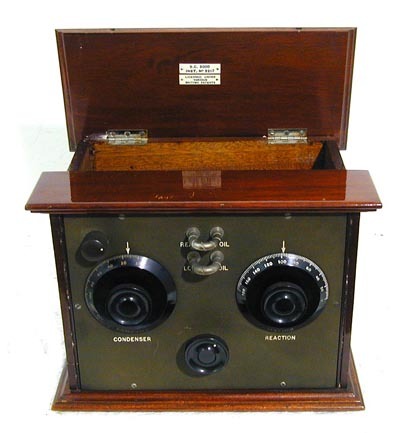 Appears absolutely original, very good condition (some scratches on the lid) and complete with all valves. This set is believed to have changed hands a few years ago for over four times this price. c.1924. Neat little horn speaker, about 10" high. Made by the firm of C. A. Vandervell, famous of course for their motor accessories. 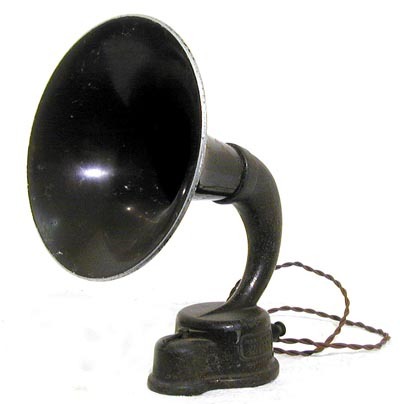 Small is beautiful as far as horns are concerned, and this is a nice little specimen in original black crackle finish and working condition. 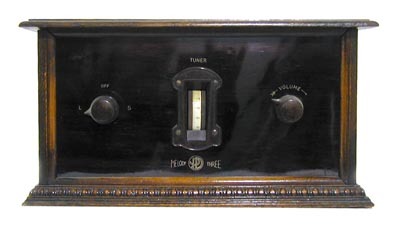 American 5 valve receiver, 1927. The unusual name comes from the location of the makers, at Ann Arbor, Michigan. 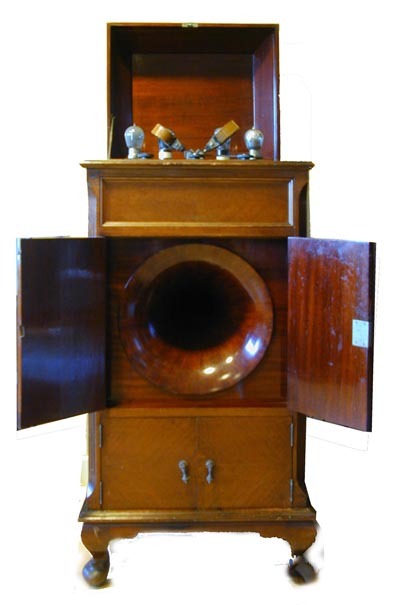 It is a conventional 5 valve TRF, but of very good quality in an unusual curved front cabinet. The back of the cabinet is covered in a comprehensive instruction guide. 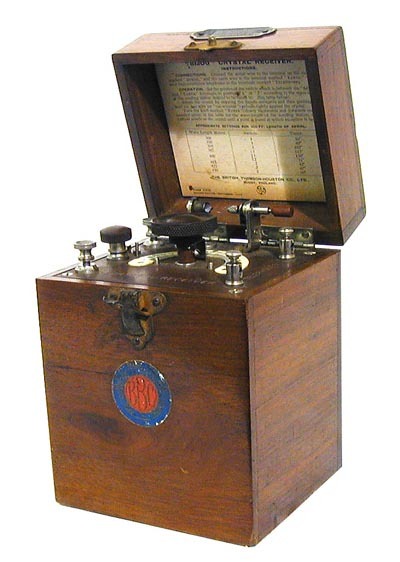 The valves are US type 01A, and a label inside says that 'All filaments are OK'. (Wehavenot confirmed this.) In general the condition is very good and everything appears original. 1929. 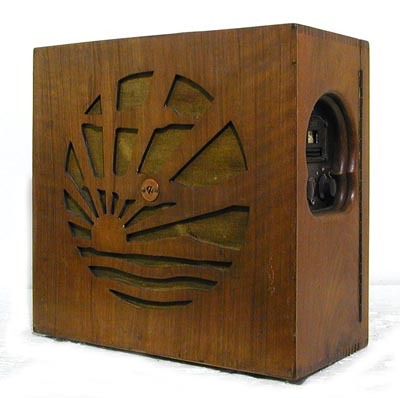 Philips made several mains sets around this time and a range of unusual looking speakers. 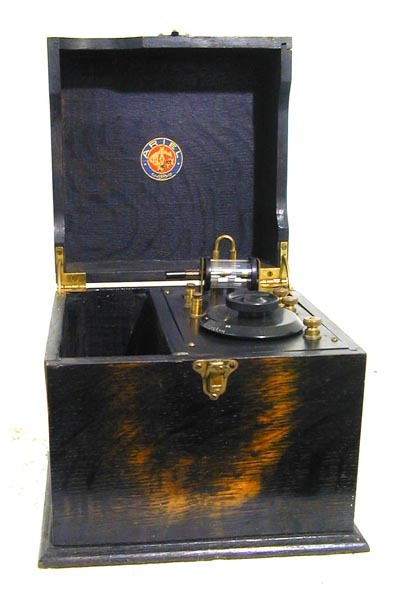 This is a 3 valve TRF in an enclosed bakelite cabinet with lift-up lid. 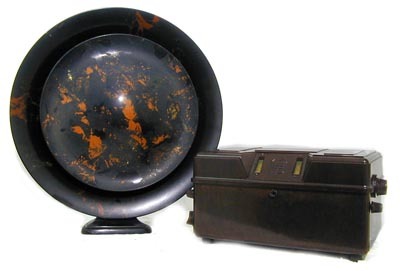 The speaker is one of the flecked bakelite 'dish' types which has very attractive figuring in the bakelite. Both set and speaker are excellent examples, working.